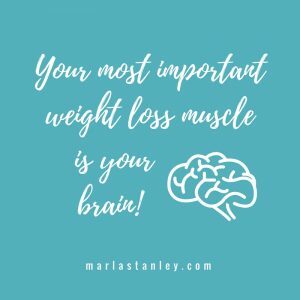 We have been talking about how your brain is the most important weight loss muscle that we all have, and how significant this can be as you set a strategy for total health transformation. Remember, we aren’t about just dropping a few pounds on a juice cleanse and gaining it back with reinforcements. I want to see you healthy inside and out, thriving a year, 2 years, or 5 years from now. True health begins at the heart level, and I’m about to share some strategies that will get you there! Nope, none of them have much to do with exactly what you put in your mouth, whether or not you run marathons, or the number on the scale, but I promise you that they have everything to do with your long-term success losing weight and finding healthy. When you make the decision to change, everything shifts. This is a “no going back”, passed the point of no-return kind of call you are making. Does God have a better life for you ahead? Then step by faith into it, and release everything behind you. None of that junk holding you back is getting you there anyway. Did you know that when you complain you are setting up barriers for blessing? You will walk right by all the good and perfect gifts your Father is showering on you and miss them completely. And, can I tell you, there are some BIG and wonderful things He has for you along this journey. The more you can foster your contentment in Him and grasp the work He has for you to do, the simpler this weight loss will become. I’m not talking about about projecting some crazy idea in front of yourself and just thinking things into existence. There’s actual work involved in achieving anything worthwhile, and using Directive Affirmation will help you lay the mental pathways to get there. This strategy piece is also aligned with Paul’s teaching to believers about how to actually “change the way you think” as we become more like Christ! As you really dig into your health transformation, you are going to need to surround yourself with support and accountability. The greatest support you could have is that of your Creator! He knows you inside and out, every part of your being, and every cell in your body which you are reprogramming. So, it seems like prayer is a good place to start as you work toward a healthy life. Truth-it’s painful, but also freeing, life-giving, and full of hope. You’re going to need all of that as you shed the weight. In fact, this part is really going to help you release the things of this world (emotional eating, sugar addiction, obsessively thinking about food, mindless eating, etc) and dwell what grounds you and brings stability in the midst of change. It’s here in the land of TRUTH that you zone in on who God is and who He says you are! What was your greatest takeaway from this discussion? Pop over and tell me in our HeartCore Insiders Group!